Enniscrone is one of Ireland’s finest links golf courses set in scenic splendour in Killala Bay. This championship venue provides golfers with the ultimate golf vacation experience – dramatic dunesland, an inspired design concept, superb greens all year round and breathtaking views. Originally designed by the great Eddie Hackett – Enniscrone’s reputation as a top class venue has been embellished with the addition of six new holes threading the path through the mountainous dunes. The new holes, expertly designed by the famous course architect, Donald Steele add an exciting dimension to the 27 hole championship layout. 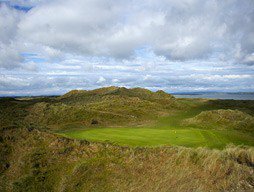 If you are looking for links golf in Ireland, then Enniscrone will not disappoint. Enniscrone Golf Club is not yet in our pool of Golf Courses for orders.